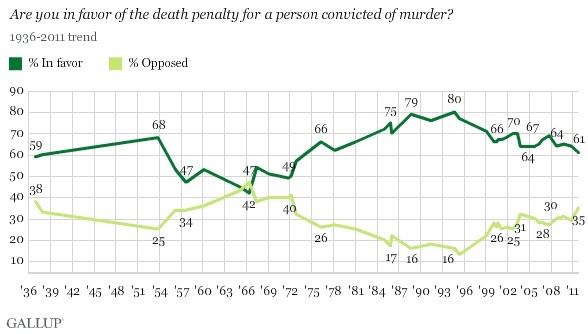 The number of Americans who approve of the death penalty is at its lowest level in nearly four decades, according to a Gallup poll published last week. The poll, which was conducted between October 6 and 9 (just two weeks after the controversial execution of Troy Davis), puts national support for capital punishment at 61 percent, a three-point drop from 2010. 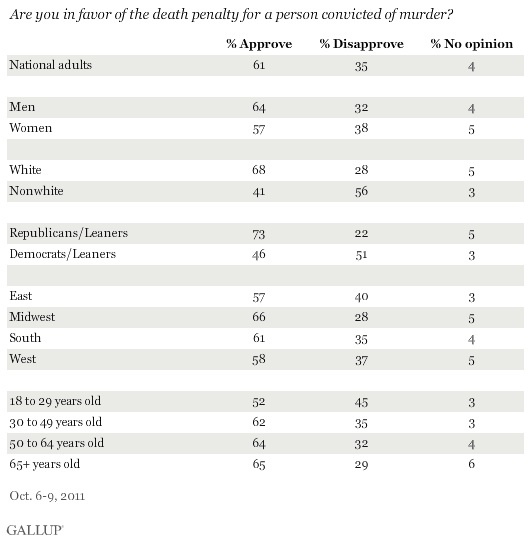 Gallup says the data reflect the lowest level of support for the death penalty “since 1972, the year the Supreme Court voided all existing state death penalty laws in Furman v. Georgia.” The numbers also show a significant drop in support since 1994, when 80 percent of Americans approved of the death penalty (an all-time high).